Tweed 5E8A Low Power Kit!!! 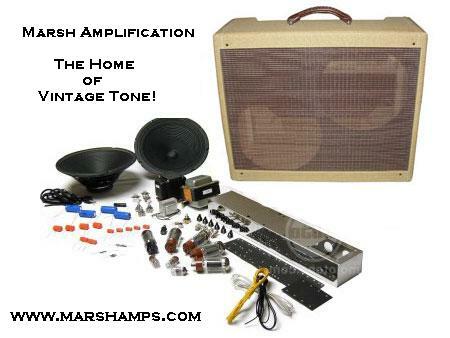 This is a high quality 40 Watt replica of one of the best amps of the Fender Tweed era!!! This is the tone used by Keith Richards and recently Eric Clapton's Cream Stage Rig. A toneful 212 Tweed amp that has the full warm head room and full power Crunch needed for Country, Classic rock and Blues!!! The Heyboer Transformers are made to the original specs that Fender gave to Triad!!! Orange Drop Coupling caps and TAD electrolytics allow you to build the Tone monster you have been craving!!! Stock Speakers are two Jensen C12Q's for great Ceramic Punch! Several other speaker upgrade are also available!!! Due to the cost increase of Sprague Atom Electrolytic Caps we are offering these as an add on option only. We feel the TAD filters are equal in sonic quality.